Shape to Fabrication 2016 is on next week, and I'm really excited about returning to London to attend and present at this event. There's an amazing line up of speakers and the opportunity to speak with the McNeel staff attending makes this an event not to be missed. Thanks to Simply Rhino for all the effort to organize this. It's 7 years ago that I last attended Shape To Fabrication, number 3 at Metropolitan Works in 2009. 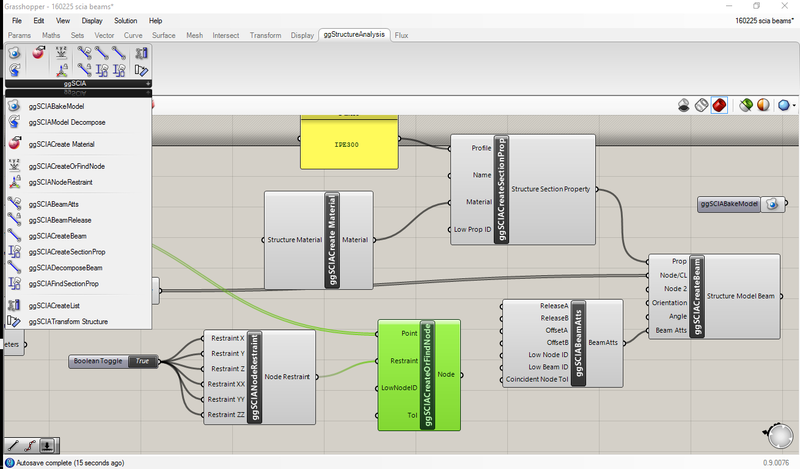 I'd been promoting and publicly releasing the Rhino plugin online that I'd been working on in house at Expedition, known as SSI (Smart Structural Interpreter Connector to GSA). Bob McNeel suggested pretty close to the event that I should present them at Shape to Fabrication. Fred Labbe (my colleague at Expedition) was already a confirmed speaker on the Santa Maria del Pianto Metro canopy, and at late notice he was generous enough to let me share the speaking slot to present the rhino plugins. This event quickly increased awareness, triggered a launching pad for Geometry Gym as a business. A meeting for clients with McNeel staff (including Carlos Perez and David Rutten) was arranged soon after by RhinoForYou and soon afterwards I had my first paying client and left Expedition to start full time on the development and support of the plugins. If you'd like to see what I presented, it was posted to youTube (but with no commentary). The tools have come a long way and it's great to have the chance to get back to this fantastic event. 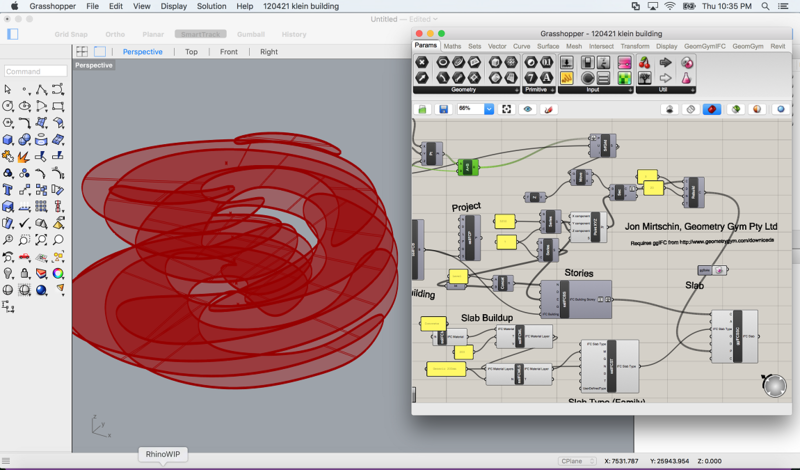 It's great to announce that Mac users can now start using the Geometry Gym plugins in Grasshopper. At this point in time to access Grasshopper, you need to be running Rhino for Mac WIP, then Grasshopper can be accessed from rhino command ExplicitHistory (the original plugin name from many years ago). At the moment I've compiled the Bullant and ggRhinoIFC addons, others can be built on demand (noting that many use windows applications programming interfaces that won't work on mac). Here's a script to test with. Klein Building.gh All feedback welcome. Rhinoforyou will be exhibiting Rhino3d and Grasshopper3d as a BIM tool at the BIM World 2016 in Paris on 6th and 7th April (stand 124). Rhinoforyou will demonstrate (and answer questions) about BIM workflows with Rhino v5 and Grasshopper using 3rd party developments by Geometry Gym and VisualARQ amongst others. A few years back, I advanced on a Grasshopper plugin to generate SCIA Engineer structural analysis data. For a few different reasons, this stalled and didn't work as successfully as I would have liked. Late last year I started work again on the ability to convert Structural Analysis IFC files into SCIA, and now I've enabled the same code into a revived Grasshopper plugin. It's now available from http://www.geometrygym.com/downloads At present it can generate beam elements with releases, restraints etc. I will be looking to enable loads, area elements and other features that users might request so please get in touch. Here's a sample gh script to start with. The core c# classes developed by Geometry Gym to import and construct IFC (Industry Foundation Classes) have been released as an Open Source project under the MIT license. Note this isn't the entire IFC code base that Geometry Gym has developed, the interfaces to Grasshopper, Revit, Rhino, Navisworks, Tekla and the various structural analysis software remain closed source (for at least the time being) as the revenues provided by these projects support the full time development of this code base. https://github.com/BuildingSMART/IfcScript (but a little more work is needed to enable this to directly use the opensource tools). Prior to deciding to open source, I studied the capability and state of existing dotnet projects I could find. Easily extensible for developing custom classes and custom interfaces with other software. Advanced constructors for classes to permit easier generation of Ifc files (other projects require explicit setting of every relationship requiring more intimate understanding of the IFC framework). The motivation for this move to opensource the code is support of the Uniform Object Library, and I have also discussed the possibility of using the tools for other open and closed source developments with others. Note also there are two initial variations of the classes to reference. The core code has no dependencies and reference, and an extension to this with references to RhinoCommon (OpenNurbs) geometry. The RhinoCommon flavour is still work in progress with more code to be ported into the opensource project. If you are interested in utilizing this project, please don't hesitate to get in touch to discuss any aspect of this. Also if you have suggestions for improvements, or wish to contribute, this is greatly appreciated.